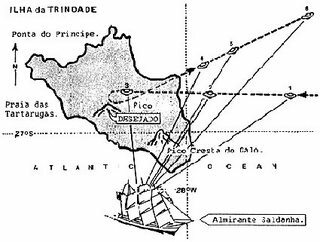 While on training exercises on January 16, 1958 in the South Atlantic Ocean near Tinidade Island, forty-eight seamen and the ship's captain Carlos Alberto Bacellar all saw several flying saucers fly by them. The event was also witnessed by two civilians who were on board. Among the civilians was a technical photographer, Almiro Barauna, who had his cameras with him. Barauna was able to take an entire series of photographs. A series of photographs of a moving object is always impressive because they are hard to fake. Not only that, but these photographs were all taken in the presence of the military men on board the boat. The photographs were taken in broad daylight around noon and were developed immediately in a makeshift darkroom on the ship. Captain Bacellar personally watched the development process to insure the film was not tampered with. On February 21 the president of Brazil, Juscelino Kubitschek, came forward and stated that the Navy had thoroughly analyzed the photographs and that he, the president, personally vouched for their authenticity. This case is so well documented it is not even funny, but it is also a good example of what typically happens. 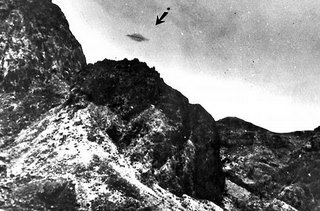 Years later a guy named Campbell said he had analyzed the photographs and the UFO was really the planet Jupiter. So fifty people all mistook Jupiter for something else? The president of an entire nation jeopardized his reputation by stating that Jupiter was a UFO? I don't know about you, but I have never seen Jupiter in broad daylight at twelve o'clock noon. And when you see the pictures, Jupiter doesn't appear as a tiny spec, it's huge. Maybe it wasn't a space ship, but don't let people feed you ridiculous statements and tell you it was Jupiter!